Many of the automated Decision Aids used in real time applications like Search and Rescue and Plume Dispersion are now designed to run using gridded model fields as input, rather than relying on a single real world observation as earlier generations of the software did. WeatherFlow has been investigating a real time application to meld these two approaches by using constantly updated real time data to help select the most appropriate atmospheric model to feed a Decision Aid. By basing this critical decision on real world data using a standardized process, decision makers can be more confident that the most effective data and models can be brought to bear rapidly and based on solid scienti4fic reasoning. In a related effort, WeatherFlow is working with partners to investigate different algorithms for generating real time virtual gridded observational data. Starting with actual observational data (which is usually not coincident with model grid points), these techniques use varying interpolation schemes to populate a virtual grid, converting a limited set of real data points into a broader two-dimensional grid, which can be assimilated far more effectively into the latest high resolution models and Decision Aids. A separate ongoing initiative involves using WeatherFlow and other coastal observation data to verify the performance of various weather models. 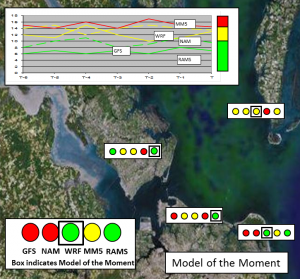 The initial analyses from this project have indicated that inclusion of these coastal data sources in the verification results in a significantly different evaluation of model accuracy, which may support a conclusion that forecasters could be placing too much confidence in model performance in the coastal zone. Finally, two ongoing projects are specifically examining the performance of weather models in the highly variable coastal zone, with the objective of identifying strengths, weaknesses, and methods to improve model performance, with the overall objective of improving forecasting for the accelerating U.S. offshore wind industry.